What is MTConnect? We have a few resources to get you acquainted with the open, royalty-free, universal manufacturing communication standard designed specifically for shop floors. It is also important to know about MTConnect compatibility. You can see a quick video, as well as see our resource pages on What is MTConnect and MTConnect specific solutions. MTConnect is a great resource on a manufacturing shop floor and machine shops. CNC machine automation has become a more attainable goal with this protocol. The reach of the protocol has grown each day and it’s full of surprises. For example, many people assume MTConnect will only work on CNC machines, but did you know it can also work wonders for mold making technology? 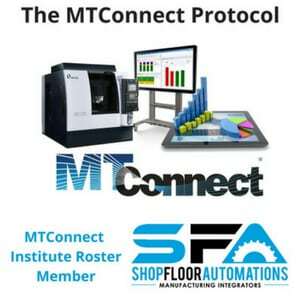 Shop Floor Automations has taken the time to compile a list of ways you can use the MTConnect protocol. Please note that this is a general guideline and that MTConnect may not work with all machines. MTConnect Connect compatibility changes constantly, and we strive to keep this list as up to date as possible. These are also not the only machines that can use MTConnect – we encourage you to contact Support with any questions. Matrix II (CyberTechTurn) Win7 n/a 1/1/12 v1.1 CTT Dual Turrent only! FANUC FOCAS is a set of library files (.dll), that can be accessed by applications to retrieve most of the information inside of the CNC. The FANUC FOCAS function is normally accessed by using Ethernet or HSSB. Common data that is available through the FOCAS are CNC state (running, idle, alarm), part count information, program name, number, size, and date modified, tool and work offsets, alarm number and text, feed overrides, parameters, positional data, spindle speed and Modal data. Below is a common list of controllers that would feature FOCAS. Older controls can have the embedded board retrofitted or added to the machine using the Data Server Board by contracting FANUC directly. If those steps took you to the Ethernet page and/or the FOCAS page, then you’re good to go! A FOCAS Library tool has been developed by Predator Software, to determine if these libraries are installed and activated on the FANUC controlled CNC machine tool. By downloading, installing and connecting your machine to the network, you will be able to verify. Refer to the list below and contact us here for more info. You may also call us at (877) 611-5825 to get started! Please note: You may download versions of software available under some of our SFA product pages, but without an active Software Maintenance Agreement, you will not receive serial or access numbers to install the latest versions.